The blue sky and the hundred-degree temperature signify that summer is in full swing. And on Sunday August 12, 2001, there was no second-guessing that summer was here. What would be the best way to enjoy the day? Catching sunrays at the beach or supporting the movement that never seems to die? Then the call came in, and Digital Aztlan was going to do both. The Oso Car Show took place in Long Beach California, combining bomb rides with the cool Pacific Ocean breeze. 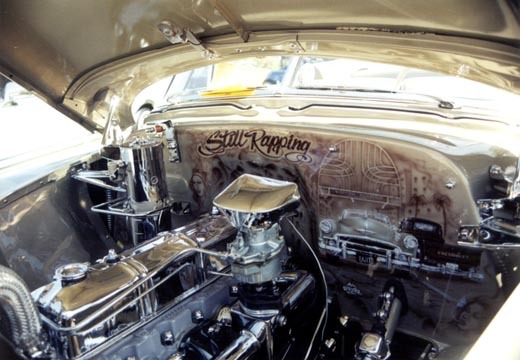 It always amazes to see that the Lowrider Car Movement is as strong as ever, and continues to expand. How could the movement have lasted so long since the type of vehicles have not changed much? Artist Eugene Delacroix (considered one of the leaders of the art movement �Romanticism�) expressed that "Newness is in the mind of the artist who creates, and not in the object he portrays." And the artists behind these mechanical sculptures do just that; create new inventive ways of stylizing their cars. People of all ages gathered together to appreciate this Chicano phenomenon that has grown into a fine art. Strolling along the premises to gaze at the cars is like walking through a museum and staring at priceless paintings. Each and every car is made up in it�s own unique way. With seagulls off in the near distance and the ocean waters brushing up against the shore, you could really appreciate the work of these creative individuals. Artists from the Brown Pride Car Club, Forever Clown�N Car Club, Illustrious, Temptation and Chicano Style were among the many that displayed their vehicles. For on this gorgeous afternoon, these Car Clubs were the da Vinci�s, Constable�s, Rivera�s, and Van Gogh�s.